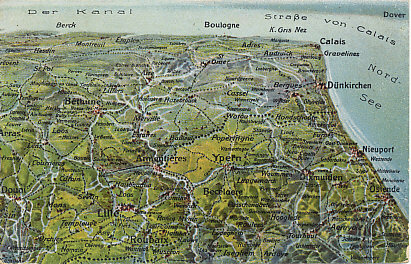 German postcard map of the Western Front in Flanders, looking south and including Lille, Arras, Calais, and Ostend. In the Battle of the Yser in October, 1914, the Belgian Army held the territory south of the Yser Canal, visible between Nieuport, Dixmude, and Ypres (Ypern). Further north is Passchendaele, which British forces took at great cost in 1917.